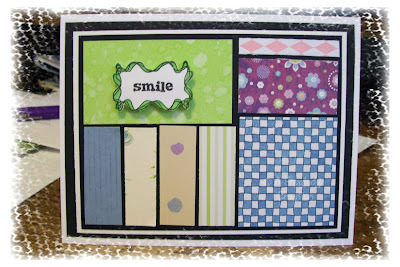 I had tons of scraps all kinds of sizes that I found when I was cleaning my stamp area awhile back. I kept the "larger" ones and tossed them all in a container. You never know what you are going to be able to do with the scraps - sometimes they are the perfect touch for a project you are working on. Well I needed to do something for a quick hello card so I grabbed the scrap bucket a couple of matting papers and a card base and went to work LOL! This is what I ended up with. I simply cut the scraps to fill the spots sorta like color blocking I guess. No 2 pieces are the same here! I stamped it with my Noir Palette Ink and then colored the edges with my Melon Copic Spica Glitter Pen. Then I cut around it and used a piece of foam tape to adhere it so it was raised a bit. Katharina's Blog - with some CANDY!!!! !